Granville® is a high-quality, easy-to-use metal paint which can be applied directly over rust and offers unique advantages to individuals and professionals! Prior to application, the surface needs only minimal preparation, while the paint offers long-term protection and excellent finish. Made in the UK and represented in Cyprus exclusively by Leo Patriotis Ltd. Get to know it – you’ll love it! Thanks to its 3-in-1 formula, you no longer need to purchase primers, undercoats and paints separately! In other words, Granville provides everything…. in 1 package! All you have to do is make the necessary metal preparation and start painting! After you make the necessary metal preparation , apply the paint directly over the metal and allow to dry for 4 hours. Granville is thick and easy to spread, making metal painting a piece of cake. Rusty surfaces or surfaces that have never been painted before, require two coats. Metal is vulnerable to water and weather conditions. 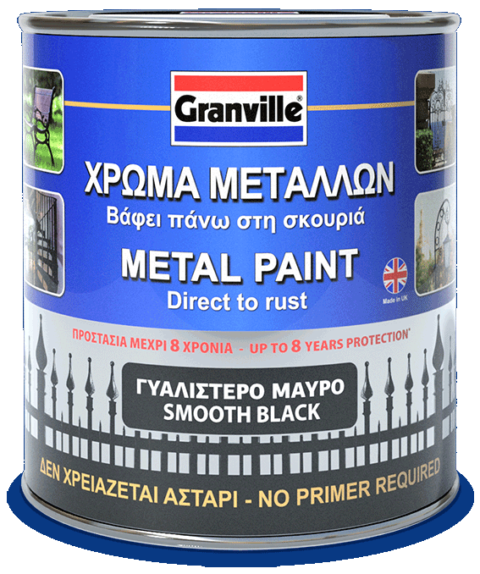 But Granville, thanks to its groundbreaking formula, ensures rust protection for up to 8 years, provided you make the necessary metal preparation. Ideal for all weather conditions and, especially, the high temperatures of Cyprus. temperature is 8ºC to 25ºC. 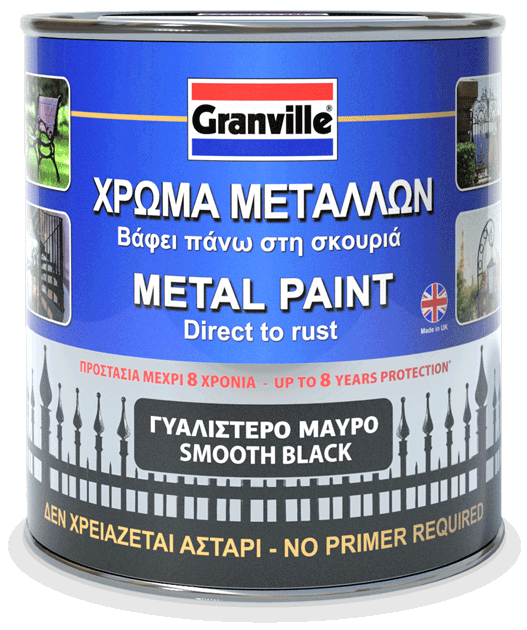 Granville protects, decorates and revives your metals. With Granville, you don’t need to abrade for hours. After completing the minimal metal preparation required, you can apply it directly over rust! Thanks to its groundbreaking 3-in-1 formula, no primer is needed! *On difficult-to-paint surfaces, such as aluminium and galvanised metal, use the appropriate primer. After the proper metal preparation and once the paint is applied, Granville prevents rust, extending the metal’s life cycle. Caution! Make sure to adequately cover the entire surface and especially the most difficult-to-paint areas (such as edges, corners, heavily pitted areas). This product does not contain xylene (a liquid used to dilute materials), making it environmentally friendly. Granville does not need any special thinner, giving you the opportunity to use any turpentine you wish. Metals have now found their best friend, Granville! Offering a variety of advantages, it prevents rust while saving you time and money, offering complete metal protection. Granville® ever-growing paint palette offers you a plethora of hammered, glossy and galvanised paints. The colours on the screen or the printed colour label may vary from actual paint colour.